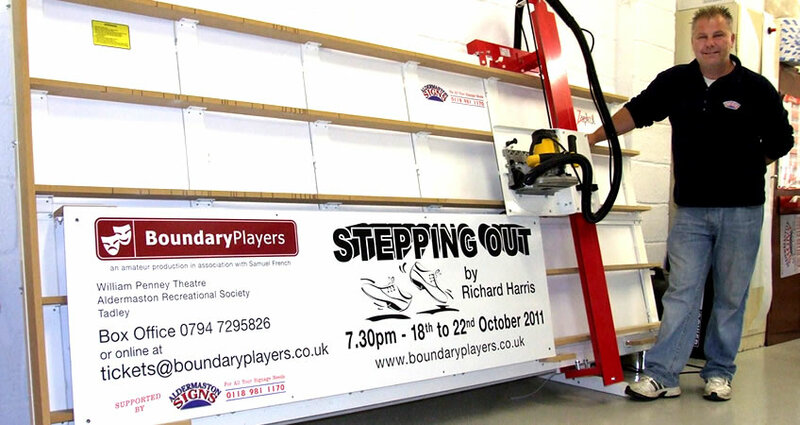 Thriving signmakers Aldermaston Signs have streamlined the all-important sheet cutting stage of their production process with a ZM12 vertical panel saw from wall saw specialist Zapkut Limited. Based in Berkshire, UK, the signmaker has an enviable customer list, including corporate giants such as Motorola, Samsung and LG, government bodies such as the Atomic Weapons Establishment (AWE) and a host of local businesses across a broad range of sectors. Established over 30 years ago and acquired by current business partners Trevor May and Karen Wild in 2005, the company is growing steadily, despite the current challenging economic landscape. A basic requirement of growth is, of course, space, so when the opportunity arose earlier in 2011 for Aldermaston Signs to move from its existing unit to a larger one on the same industrial estate, Trevor and Karen were quick to accept. Trevor had met Keith Bunker, Managing Director of local panel saw specialist Zapkut Limited, a couple of years earlier. Recalling some of the details that Keith had given him on Zapkut’s saws, he got in contact to get up to date on the range. Having discussed the capabilities of Zapkut’s ZK and ZM ranges (full details are available at www.zapkut.co.uk) Trevor opted for the moving column Zapkut ZM12. Probably the world’s most compact and competitively priced moving column vertical panel saw, the wholly British-made ZM12 caters for sheet sizes of up to 2500mm x 1250mm (8′ x 4′). It offers plunge and bevel cutting, quick switching between cross and rip cutting, mid-way supports for smaller workpieces, and an innovative dimensioning system making the precise positioning of cross cuts quick and easy. Also available is the ZM16, for sheets of up to 3100mm x 1600mm (10′ x 5′). The ZM21, for sheets of up to 3100mm x 2100mm will be available soon. An optional floating router head, ideal for v-grooving materials such as Di-bond, is currently under development. “It was the ZM12’s moving column and very attractive price tag that convinced us,” said Trevor. “It’s much more compact in operation than the Holz-Her was and as far as safety is concerned – well, it’s in a different league.” Additionally, despite the fact that the ZM12 is designed for sheets of up to 8′ x 4′, Trevor has found that the machine’s precision is sufficient to allow him to easily cut up to 3m lengths without the blade deviating from its original line. Trevor itemised the profound differences this makes to the business. “We can respond to customers’ requirements more rapidly, deliver to tighter lead times, be more competitive on price and improve our profit margins,” he said. By working with a broad portfolio of customers, offering a wide range of high quality signage products and services, and refining their processes through the use of innovative solutions such as the Zapkut ZM12, Aldermaston Signs are not only surviving the current economic turbulence, but thriving despite it.